Ghee (also known as Clarified butter) is made by evaporating all the water from milk solids, leaving a rich, aromatic, almost nutty flavoured alternative to butter. 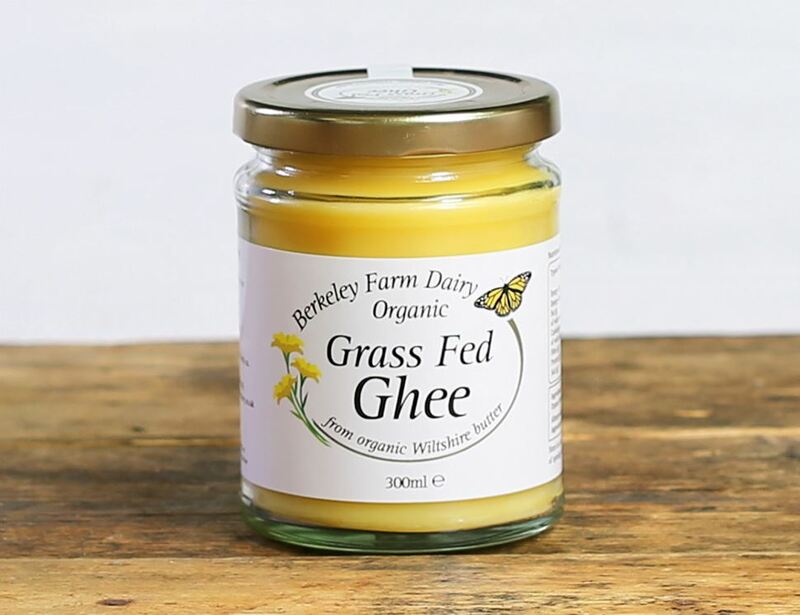 Berkeley Farm's ghee is made with cream from the organic milk of their grass-fed Guernsey and Friesian cows. It won't burn at high temperatures, so it's perfect for frying, and a dollop of this in the pan will transform your curry. This cream for this ghee is produced by Guernsey and Friesian cows in Wiltshire valleys where they graze wildflower meadows full of the greenest grass. Nick and Christine milk their cows at exactly 4.30am and 3.30pm. It takes Christine about 2 hours to get through the whole herd and she always gives them a quick health check like a proper mum. Also Berkeley Farm Dairy uses plastic bottles, which are much easier to recycle than tetra-paks. Ambient storage. Once opened use within 3 months if keep at ambient temperature or use by best before date if refrigerated. Not suitable for home freezing.